South Korea may shoot down parts of a North Korean rocket if they breach the state's territory, South Korean officials said Monday (March 26), according to news reports. World leaders from the United States, China, Russia and other nations met in Seoul for a two-day summit to discuss ways to secure the world from nuclear terrorism, but concerns about North Korea's planned satellite launch aboard a long-range rocket have dominated the discourse, the Associated Press reported. "We are studying measures such as tracking and shooting down (parts) of a North Korean missile in case they stray out of their normal trajectory" and pass within South Korean territorial lines, said Yoon Won-shik, a vice spokesman at the Defense Ministry, according to the AP. He called the launch a "very reckless, provocative act" that threatens peaceful relations on the Korean peninsula. Earlier this month, North Korea announced that it intends to launch an Earth-watching satellite into orbit on a long-range rocket in April. North Korea said the move is part of the nation's peaceful space program, but U.S. and South Korean officials claim the satellite program is a disguise for testing military missiles. According to intelligence from the South Korean and U.S. militaries, North Korea has moved the main body of the rocket to the village of Tongchang-ri, a launch site in northwest North Korea, CNN reported. The launch pad at Tongchang-ri is about 35 miles (50 kilometers) from the city of Dandong on the Chinese border. This new site would allow North Korea to launch rockets on a different trajectory from the west coast that avoids them passing over other countries, like Japan, reported the AP. President Barack Obama and South Korean President Lee Myung-bak held a joint news conference Sunday (March 25) to warn North Korea to stop the planned launch or face serious consequences. North Korea's new leader Kim Jong Un recently entered into an agreement with the U.S. to halt long-range launches in exchange for 240,000 metric tons of food to curb the country's widespread famine. Obama said Sunday that if North Korea continues with launch preparations, it could jeopardize this food aid agreement. The launch is scheduled to occur between April 12 and 16 to coincide with the centenary of founder Kim Il Sung's birth, according to news reports. 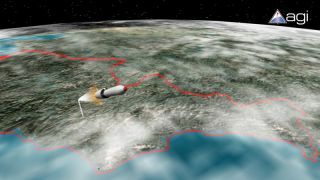 In April 2009, North Korea attempted a similar satellite launch that was widely criticized. North Korean officials said the mission succeeded, but U.S. intelligence agencies claimed the vehicle failed during ascent, which caused the rocket's second and third stages and the onboard satellite to plummet into the Pacific Ocean. The 2009 event triggered the United Nations to tighten sanctions against North Korea.